Today is “Remembrance Day” in the UK and it commemorates the sacrifices of members of the armed forces. In the states, we call it Veterans Day. In November 1918, Moina Michael, an American, was inspired by the “In Flanders Field” poem to wear and distribute poppies in honor of fallen soldiers. During the month of November, poppies are worn by men and women throughout the UK. In Scotland, this weekend, we noticed the poppy was a little different (had four petals rather than two) but the sentiment was the same. I even saw a dog with a poppy on his collar. Internationally the poppy is becoming more popular but not so much in the US. I would love to see it make a comeback. The poppies are sold and the money raised is used for soldier projects. 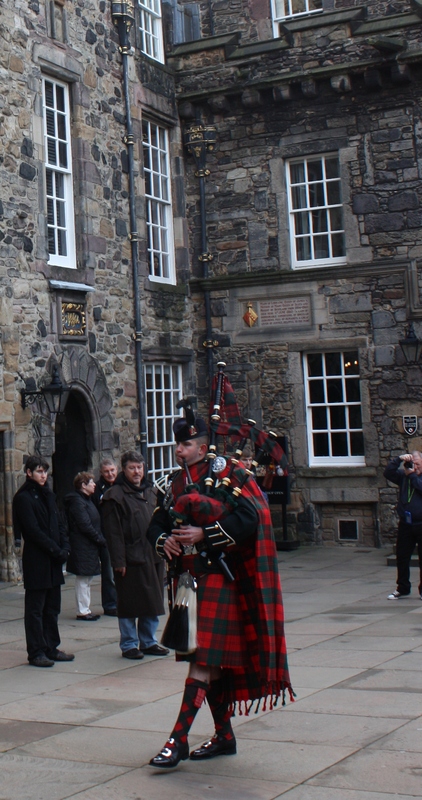 We were at the Edinburgh Castle and participated in the two minutes of silence at the 11th hour of the 11th day of the 11th month, which is the anniversary of the ending of the First World War in 1918 between the Allies and Germany. It was very moving even if a few of the other tourists there didn’t realize the significance of the ceremony. That was my son playing the pipes. I’m so proud of him. I can understand why you’re proud of him. He plays so well (and was so very patient with the all the tourists clamoring for a photo with him). We were honored to be at the castle to participate in the 2 minutes of silence and to hear the pipes (always so moving).